Digital patient communications of the future: Can the NHS learn from retail and banking? Patients are consumers too. Many of them are digitally sophisticated in other realms of their daily life. Digital transformation. Cutting out paper. Applying Artificial Intelligence. We hear a lot about new technology in healthcare, and rightly so, given its potential to improve care outcomes and boost efficiency. But its ability to power the next generation of patient communications is still largely ignored. Unlike sectors such as retail and banking, the NHS is only just picking up pace on its digital engagement journey. There remains a massive reliance on posted letters to communicate with patients and the responsive service of the best consumer organisations seems light years away. But with a little more effort, putting the latest mainstream technology to work in healthcare could be closer than we think. The first thing to remember is that patients are consumers too. Many of them are digitally sophisticated in other realms of their daily life – ordering groceries online, sending payments from their smartphone app, receiving text alerts and notifications and conversing with chatbots for online customer service. So while letters still have their place, there is a growing demand for digital amongst patients. Smartphone in hand, we spend more time on messaging apps than on any other. Channels like Facebook Messenger have huge penetration while Whatsapp is the most downloaded UK app, used by 38 per cent of mobile owners. The NHS e-Referral Paper Switch Off is a move in the right direction, but paper is still everywhere. The referral appointment setting process might be digital but in the majority of cases, the confirmation letter still arrives in the post. The NHS Digital First strategy identified a potential £413m saving from digital appointment booking and reminders. 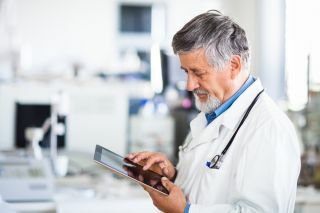 A number of hospital trusts are introducing a digital approach alongside traditional postal letters, with our data showing 53 per cent of patients choose to receive letters digitally when given the option. Extending these regional initiatives and adopting new channels opens up enormous efficiency opportunities. There are huge gains to be made simply by expanding the NHS’s use of digital messaging and taking advantage of new opportunities like Apple Business Chat and RCS (Rich Communication Service) – touted as SMS’s rich media successor. To see how the next phase of digital comms could play out in the NHS, look at banking. For most of the last decade, the likes of Barclays and Lloyds have been adding digital channels and tying them into their back-end systems and databases. This ‘omnichannel’ approach means customers receive consistent service, no matter which method of contact, on whatever channel they choose. As new channels appear, the banks just plug them into their messaging infrastructure. The result? Customers have flocked to convenient digital banking: almost 22 million used a banking app in 2017. Branch visits dropped from 476 million in 2011 to 278 million in 2016. The parallels are obvious. By introducing digital messaging at key points in the patient journey, like before and after GP and hospital appointments, it’s possible to significantly cut communication costs and reduce hospital visits. From the way banks have embraced the technology, we know that the security measures critical for healthcare are available. Omnichannel healthcare – linking existing and new digital channels to the same back-end systems – would give patients a choice, a consistent experience and would support new channels as they appear. RCS, for example, offers capabilities such as verified sender, rich media (images, GIFs and videos), suggested reply buttons and suggested actions. RCS is Android-native and, like SMS, is increasingly being supported as a messaging inbox capability by network operators so patients won’t need to download a dedicated app. Vodafone already supports RCS, with other UK operators expected to add it this year. Worldwide, RCS is used by over 350 million. Its popularity is rising quickly with over a billion people forecast to be using it in 2019 (GSMA) and more than 3.2 billion predicted by 2023 (mobilesquared), giving it the opportunity to leave the likes of WhatsApp (currently 1.5 billion users) well behind. The NHS could use RCS to add rich conversational messaging, with action buttons that would help automate simple query handling, form filling and questionnaire responses. Patients could also tap on a confirm, cancel or rebook appointment action button rather than typing the response back. Virgin Trains is implementing RCS for automated passenger communications right now while Npower is using Apple Business Chat to support its Smart Meter roll out.. Artificial Intelligence (AI) adds even more power to messaging. Here, AI isn’t about patient diagnosis, but informing intelligent agents and chatbots to resolve inbound patient queries. Chatbots that understand natural language mean patients could ask for information as they would with a human operator, with a real person available to help if required. The idea of messaging a virtual agent might sound strange but if it delivers better and quicker customer service, most customers are firmly in favour (IMImobile). Here in the UK, we’re increasingly comfortable with this kind of automated interaction – just look at how many people already have personal assistants like Amazon Echo or Google Voice in their homes. From Burberry’s fashion bot to Lidl’s wine expert, so many brands have already embraced chatbots to engage with consumers. It is predicted that 85 per cent of customer interactions will be managed without a human by 2020 (Gartner), with chatbot adoption expected to save $11 billion in annual customer service costs globally by 2023 (Juniper). From QR codes for self check-in to wayfinding maps and self-help videos, content-rich digital messaging would vastly improve the patient experience as well as cutting down on paper communications and inbound calls to contact centres. Patients could talk to the NHS in ways and at times most convenient to them. It would build patients’ overall engagement with digital channels, a key aspiration for NHS Digital. As for the efficiency savings, they could be tremendous, notably by cutting down the missed or superfluous appointments that posted letters often cause. Simple interactive workflows could handle most appointment setting, patient surveys like the Friends and Family Test and many other enquiries too. Fully-fledged chatbots can interpret patients’ free text responses to survey questions, then use that information to construct further questions and so gather far more useful data. That ability to base each new question on the previous answer could support self-care or handle clinical triage for first or follow-up appointments. The same automated intelligence could power outbound survey calls for Patient Initiated Pathways, PROMs and PREMs, freeing up valuable nursing time. The NHS could begin to pilot these proven technologies tomorrow. Working with patient data within regional systems is already possible. Just keep things simple and test the benefits. As long-running interoperability initiatives bear fruit, a national programme would become more feasible. Over recent years the NHS has shown how efficient and effective SMS can be for healthcare services. By accelerating the digital shift, patients will be able to interact with the NHS in new ways, with technology that is already part of everyday life.